Student Town Hall Calls for Activism Through Divestment | BANG. 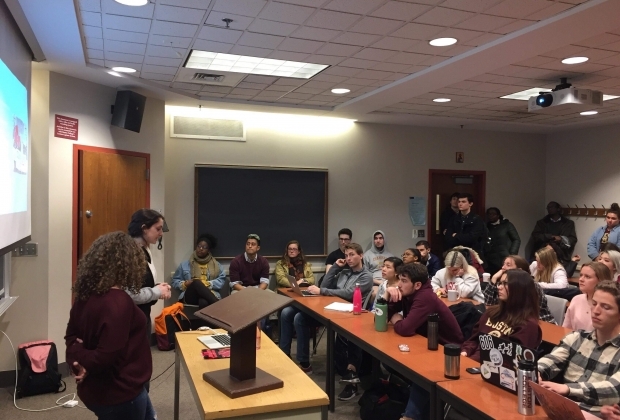 Young Democratic Socialists of Boston College, Students for Justice in Palestine, Climate Justice at BC, the GLBTQIA+ Leadership Council, and FACES held a town hall-style event regarding divestment on Tuesday evening. Each student group presented on why divestment is important to their respective clubs and the greater community, and argued that Boston College’s lack of transparency and questionable investments are not in line with Catholic values because they continue to perpetuate inequalities and human rights violations. Later, the group called for the creation of an Ethical Investment Committee to ensure that all the university’s endowment investments line up with the values of the school and the student body. YDSA went on to discuss the historical precedence of BC’s decision to divest from South Africa, and noted that multiple schools, the city of Boston, and the state of Massachusetts had all divested from the country before BC. According to YDSA, University President Fr. William Leahy told students in 2014 that BC would not lead on divestment and that no other universities with large endowments are taking action. However, over the course of the night, students presented about how universities with larger endowments than BC have divested from immoral and dangerous investments, such as Columbia University, which divested from the private prison industry. The entire country of Ireland has also divested from fossil fuels. YDSA closed their presentation by explaining that while divestment is economic, it also has strong social and political implications. Divestment makes it socially impossible for companies to do what they do by making it socially unacceptable to invest in these immoral activities. 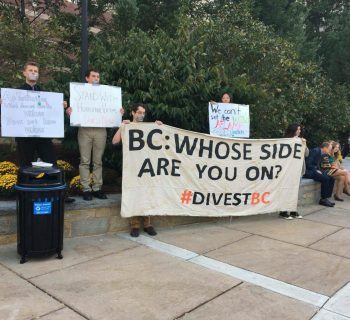 Climate Justice at BC (CJBC) went on to discuss what divestment means with relation to their group. 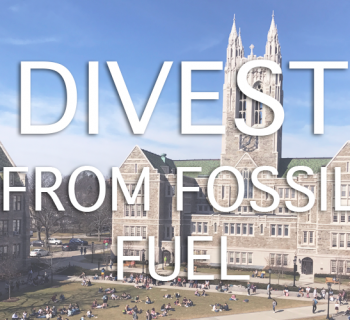 The Undergraduate Government of Boston College passed resolutions in 2018 and 2013, as well a referendum to the student body in February, which have demonstrated student support for fossil fuel divestment. However, the administration has not held the results as valid reasons to divest. The club also discussed its history and struggles with the administration, as many students have received disciplinary sanctions for engaging in protests against fossil fuel investments. These responses, along with Fr. Leahy’s lack of action, make it clear to CJBC that divestment will not happen through working with the current administration. Leaders of organizations calling for divestment urged the student body to create pressure on the administration by enacting public campaigns that force them to respond, as pressure will be necessary to create change. Students for Justice in Palestine (SJP) presented about the BDS movement, a nonviolent resolution started in 2005 by 170 Palestinian organizations to boycott, divest, and sanction Israel. BDS has the goals of ending the occupation of Palestine by Israel, giving all Palestinian citizens equal rights, and allowing the diaspora of 7.52 million Palestinian refugees to return. To boycott Israeli goods, especially those produced in occupied territories, SJP explained how BDS has created a list of products and companies to avoid, including Sabra, Caterpillar, and Hewlett-Packard. Divestment from Israel is similar to the boycott, but on an institutional level. Many religious organizations, such as the Presbyterian and United Methodist Church, as well as universities, have divested. Sanctioning the country is the most macro level strategy, which calls for a United Nations sanction on Israel until it meets the three demands and ends its occupation. SJP brought the importance of divestment much closer to home, explaining that through the US-Israel Police Partnerships, US police are sent to Israel to be trained and learn counter terrorist tactics from the Israeli Defense Force. This contributes to the militarization of police in the US, and the Americans most affected by this militarization and subsequent police brutality are communities of Black, Indigenous, and people of color. A representative from FACES discussed the importance of divesting from the prison industrial complex and private prison companies. Privately operated prisons have much higher rates of human rights abuses, especially directed towards prisoners who have mental health problems. One of the main private prison companies, GEO Group, markets itself as a “Global Leader in Evidence-based Rehabilitation,” however, in reality, the company, along with CoreCivic, controls 73% of the for-profit, private prison market in the US. Not only are these companies building private prisons, but also immigration detention centers, which generate tens of millions of dollars in annual revenues. The GLBTQIA+ Leadership Council (GLC) then went on to show why divestment is important within the GLBTQIA+ community, citing how companies like Chick-Fil-A use ‘family values,’ pseudoscience, and other tactics which create dangerous situations for those in the community. Pinkwashing is another approach which organizations, as well as the state of Israel, use to create a facade that they are more diverse and inclusive than they actually are. Israel often brands itself as a very GLBTQIA+ friendly country, even though queer Palestinians are often targeted by the Israeli Defense Force. As the club noted, selective tolerance is not tolerance, and argued that investing in these companies, organizations, and even countries which are actively working against the GLBTQIA+ community does not follow the Catholic Church’s values regarding care of the whole person nor demonstrate concern for the safety of its student body. Throughout the night, the student organizations demonstrated overlapping and intersecting reasons as to why Boston College needs to be transparent with its investments, and that these investments must uphold the “Jesuit values” that the university espouses.